Northern Australia is an area often overlooked by the backpacking circuit, save for the trip to world famous Ayers Rock. The opportunities for a conservation volunteer in Australia’s northern reaches are both exciting and very different to the rest of the country. The area around Alice Springs is a red sand sea the size of Europe. Being a conservation volunteer in the large expanse of desert allows you to explore this iconic Australian landscape, whilst getting to know the mysteries of the desert and the heart of Australia. Projects take place both in the outback area, as well as in Alice Springs itself. This area boasts the famous Ayers Rock, Australia’s best-known natural icon. Other than the volunteering projects in and around Alice Springs, Darwin offers some great projects in national parks, on beaches and in world heritage areas. Darwin is the capital of the northern territory, constructed in 1869 to be Australia’s northernmost port. Volunteering with Crazy Ants: Volunteers help scientists and indigenous rangers to bait and monitor this introduced invasive ant species. Talc Head: marine debris surveys take place in a remote tropical paradise – volunteers help to survey and remove debris from beautiful beaches. This marine project directly helps the survival and promotion of sea turtles. 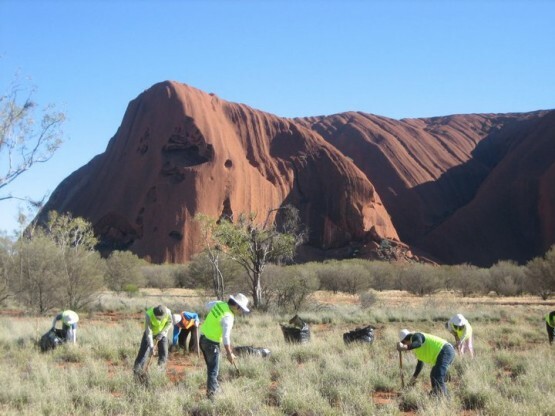 Uluru (Ayers Rock): Help protect this World Heritage Area by removing weeds at the Mutitjulu Waterhole. Note: projects run on specified dates only. For more information about becoming a conservation volunteer in Australia have a look at our conservation volunteering website. Projects take place around the country, starting on each Friday of the year. Hi I would really like to become a volunteer at Uluru. Please can you help me. I am delighted that you are keen to get involved. This blog post is now a little out of date as it was written in 2013. It is no longer possible to guarantee that you would be volunteering at Uluru. If you want to volunteer in this area why not take a look at the options available near Darwin.